The mini PLC EASY or LOGO! is mounted on a stable aluminium support. The inputs have 8 switches (on, off, pulse). An extra 2 potentiometers are connected to the analogue inputs. A 14 pin interface connector can be used to connect an external simulator. The status of the outputs is visible by 4 LEDs. The choice between analogue (0 - 10 V) or digital (0 / 1) signals for the inputs 7 and 8 are controlled by switches. The training assignments are arranged from easy to difficult. The 32 training assignments are printed on interchangeable cards. 32 training assignments on interchangeable cards. 1 Mini PLC, Easy of LOGO! 1 Set of assignments for the student and answers for the teacher. The mini PLC EASY of LOGO! can be used to control many different simulators. 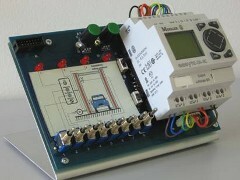 The PLC trainer is equipped with a special interface for connecting simulators. In this video you can watch a simulation of a car wash.
- Portal forwards and backwards. - Horizontal brush up or down. - Vertical brushes on or off. - Horizontal brush on or off. - Limit contacts for portal (start / end). - Limit contacts for horizontal brush (top / bottom). - Height detction for the horizontal brush.